Harry Martin was born Harold Modlin in 1917 on a small farm in Henry County, Indiana. Encouraged by his broadcasting instructor, Harold dropped out of college to join WLBC, Muncie. In addition to news and announcing he was assigned the station’s farm programs. In 1943 he was hired by the manager of WFBM, Indianapolis, with his name changed to Harry Martin. He announced and did news, including 7 years as Indiana reporter for CBS news. When WFBM farm director Henry Wood retired, Martin succeeded him. 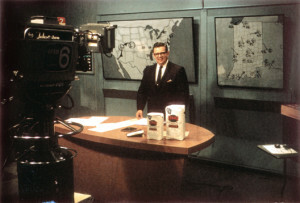 Upon the addition of television at WFBM, he became a pioneer in TV farm programming. Purina moved from radio to television with Harry and 65 Purina dealers continued to sponsor a noon program for 26 years. Harry hosted “Sunday on the Farm” and was the weatherman on Sunday night news. Harry and his wife, Marian, founded Rural Radio Network in 1972 as co-owners, supplying farm programs from their home in New Palestine, IN. The network grew with to reach every corner of Indiana with 56 radio stations. Harry was 88 when he died at his Florida home in 2005.